Cordell & Cordell Co-Founder and Principal Partner attorney-CPA Joseph E. Cordell was featured in a book by former New York Times journalist turned educator Andrew L. Yarrow. The book, “Man Out: Men on the Sidelines of American Life,” depicts the American male in modern society, through the lens of academic studies, national surveys, wide ranges of data and research, as well as interviews by various experienced professionals. Through the perspective of the 2016 United States Presidential Election, Yarrow navigates the complexities of men in today’s society, and that includes how divorce and child custody can impact a man, left on the sideline of his own life. This common theme of being left on the sideline, permeates the book, as the subhead would suggest. The ideas of who they are, what their politics may be, what their relationship is with their job, what their socioeconomic standing may be, how they express gender norms, what their racial, cultural, or religious background may be, and how their identity affects how others view them all create ripples within the fabric of men in America, who are left searching for answers. 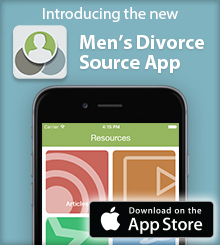 Among those searching are men facing the prospect of divorce and how that affects their relationship with their children. With the way family courts often can operate, a protective order can be issued easily, giving the mother the advantage in the case and leaving the father to spend the legal fees to defend himself against any domestic abuse charges, instead of focusing on his importance in the lives of his children. Mr. Cordell defends the role that fathers firmly have in the lives of children. The relationship between men and women is examined through the lens of modern movements that shine a light on concepts like toxic masculinity and feminist ideals. Mr. Yarrow states that while many men support female equality, others have mixed feelings regarding what it means for their identity, their jobs, and their relationship with one another. This is especially apparent in the family court system, where men can be the lesser earners of a household and still be saddled with child support payments that they may not be able to manage. Not only is the father sent into poverty over payments that he cannot afford, but he is labeled a “deadbeat dad,” because he is financially unable to support his children. They also are saddled with the notion that because they may not have custody, they will at least have “visitation,” a term that has been under attack for the way it portrays fathers as nonparents. These sentiments resonate in the hearts of many men in America, and Mr. Yarrow explores those avenues as opportunities for change, but in order to foster the change in ideals, men need to be brought into the fold through the understanding of why these struggles are so real. Mr. Yarrow looks to bridge the gaps between present ideals and identity with ones that are so ingrained in the lives of men across America, offering an educated and comprehensive voice in a world of vocal division.